Lang Son (VNA) – Four Vietnamese northern border provinces of Lang Son, Quang Ninh, Ha Giang and Cao Bang and China’s Guangxi Zhuang Autonomous Region will bolster friendship exchanges and practical cooperation, contributing to the Vietnam-China comprehensive strategic partnership. Under a Memorandum of Understanding (MoU) inked between the two sides at the 10th session of joint working committee of the four Vietnamese localities and Zhuang Autonomous Region held in Lang Son province on March 22, they agreed to continue delegation exchanges, and enhance mutual political trust. They encourage local authorities to set up mechanism to remove bottlenecks during cooperation in the fields of trade, tourism, border management and border gate management. Both sides reached consensus on joining hands to realise the MoU between the two Governments on promoting links between the “Two Corridors and One Economic Circle” framework and the “Belt and Road” initiative. Regarding transport infrastructure, they will work to enhance land road and railroad connectivity between Guangxi and Vietnam. In addition, they will urge competent ministries and sectors to discuss a project on building cross-border economic cooperation zones so that it will be submitted to the Governments for approval soon. Also, they agreed further cooperation to upgrade border gates and develop border markets. Policies on border trade activities will be updated in a timely manner to facilitate import-export activities of enterprises from both countries. Touching on tourism sector, Lang Son and Guangxi provinces will study and promote pilot operation of the Tan Thanh-Po Chai tourism zone, and Quang Ninh and Guangxi will work to form a complete border tourism route. Meanwhile, Cao Bang and the Chinese locality will put forth the implementation of the agreement on protecting and exploiting Ban Gioc-Duc Thien water fall tourism resources. 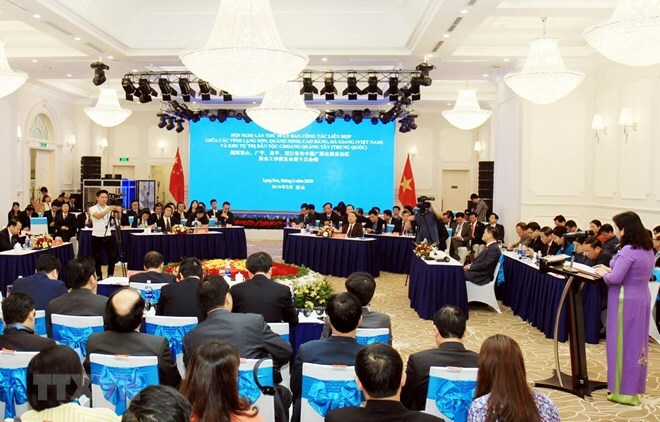 Furthermore, border management agencies concurred to strictly carry out three legal documents on border management, ensuring stability and social safety in the border area, and boosting cooperation for border socio-economic development, and minutes of the Vietnam-China Land Border Joint Committee’s sessions.